﻿ Like with The Gaslight Anthem, there’s a sense of resolute, almost comforting familiarity with Hot Water Music. Both are swayed by timeless Americana that lends something of a sepia-soaked nostalgia to tracks that can seriously go for broke in terms of emotional, anthemic power; the only real difference is that the Floridians give in to their punk-driven impulses more. Either way, while Hot Water Music may take their sweet time when it comes actually putting music, they’re always a good band to have around regardless. Thus, it’s always tempting to be a bit more generous to Hot Water Music than they may realistically deserve; their way of getting around doesn’t tend to change or evolve, but there’s just something about them that bypasses almost all critical faculties and hits straight at the joy centres. And now, five years after their comeback album Exister did just that, Light It Up is shooting for a similar effect, one that Hot Warer Music are more than capable of hitting. Granted, it’s a little rougher around the edges, and its reliance on the well-versed Hot Water Music-isms keep it from landing with the same force, but to a degree, it wouldn’t be had any other way. Both Chuck Ragan and Chris Wollard have little by way of distinguishing features for each other, but with their forty-a-day rasps, they have easily the roughest, most earthy voices that alt-punk has to offer, and when paired with the sort of hearty, melodic punk instrumentation that has long been a staple in the genre, the gravitas of tracks like Complicated and Rabbit Key is really something to behold. And sure, Hot Water Music haven’t undergone any great musical evolution here, but why should they? Light You Up is the effort of a band looking to stay in line with what they know, but also one that has aged gracefully, simmering instead of raging and stepping back into more mid-paced territory. It leaves tracks like High Class Catastrophe and Take You Away falling into an almost Foo Fighters-esque mould, albeit approaching it with greater vocal gusto, while Sympathizer‘s darker guitars give an air of curdled, clattering frustration that’s unlike anything else on this album, with a righteous fury that works with Ragan’s bellowing almost perfectly. It’s good to see that Hot Water Music aren’t retracting into laziness, even eight albums in, and that they’re working in directions that are still worth investing in but play to their strengths. It’s perhaps why the title track is the weakest cut here, a minute-and-a-half straight-up punk track that might have the fire that a lot of this album is lacking, but sees Ragan and Wollard pushed into a choppy delivery that doesn’t flatter either of them. It’s not awful – by this point, Hot Water Music are beyond stumbling so badly it’s an outright failed effort – but it only serves to highlight how much better the band are at working with their advancing years instead of against them. It’s not a bad thing that Hot Water Music are embracing their age either; if anything, it’s led to Light It Up having some of their greatest displays of weight and maturity yet, the work of a band clearly in touch with themselves but not letting it bog them down. At the end of the day though, this is unlikely to be one of the go-to Hot Water Music albums – it’s lacking a Trusty Chords or even a Drag My Body to really form a convincing peak – but there’s enough within the performance and open emotional resonance that shows why even their B-material is totally worthy of any time put into it. It may be “just another Hot Water Music album”, but that’s hardly a bad thing, is it? 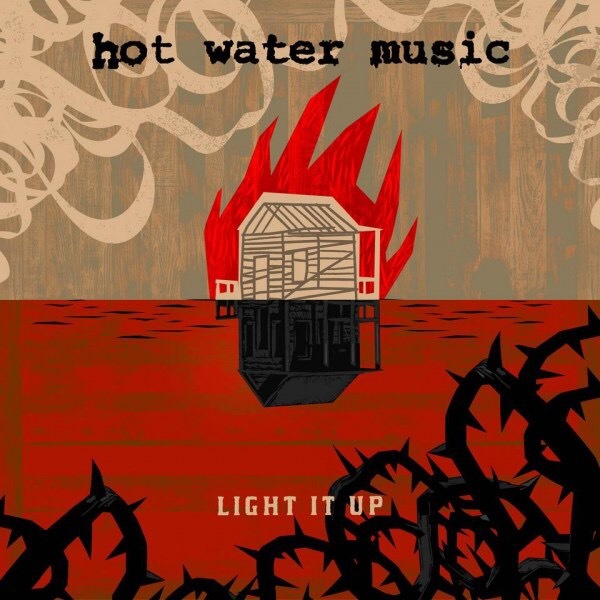 ‘Light It Up’ by Hot Water Music is released on 15th September on Rise Records.